Philadelphia Eagles quarterback Nick Foles catches a pass from wide receiver Nelson Agholor (not pictured) in the third quarter. 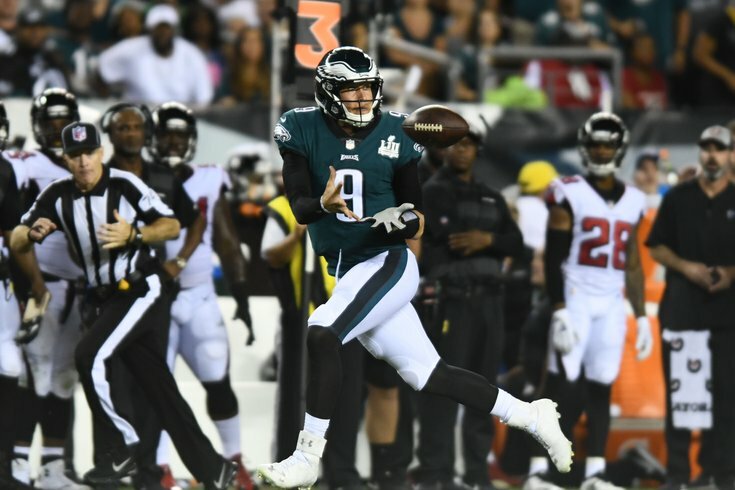 The Philadelphia Eagles showed grit and determination on Thursday night to eek out a tone-setting 18-12 win over the Atlanta Falcons. Anybody watching could tell you there was one play in the third quarter that seemed to give the Eagles offense just enough spark to take control of the game. Head coach Doug Pederson called a variation of the immortal Philly Special that closely resembled the gadget play run by the Patriots in Super Bowl LII—you know, the one Tom Brady couldn't catch. Here are the two plays together, for reference and for laughs. Nick Foles didn't have anywhere near a good game against Atlanta, but he proved again that he can step up in big moments and swing momentum for his team. In advance of the New England Patriots' week one matchup with the Houston Texans on Sunday, Brady was asked by a reporter whether he took note of the play the Eagles ran on Thursday night. The quarterback, always gracious unless asked about his personal trainer, swung the conversation away from "Philly Philly" with a personal anecdote about fantasy football. "I mean, good execution wins games," Brady said. "So I think that's ultimately what we've got to do. When you make the plays, you either make them or you don't." That would have been a decent enough answer if he'd left it at that, but then Brady brought up his son's fantasy football squad. "He's looking at his projections for this week and goes, 'Dad, I'm supposed to lose,'" said Brady, whose son was starting Falcons quarterback Matt Ryan in his fantasy league. "I said, 'Well, none of that matters, because, you know, you've actually gotta' go play the game.'"